One World Actors Prods.-Animal Rescues Non-Profit hasn't added a story. How can we possibly abandon these desperate Lions, Striped Hyenas, Baboons, Caracal, Camels, Horses , Geese, Donkeys and Peacocks, left to starve at defunct Ibb Zoo in the midst of a brutal civil war? How can we continue to witness them being shot dead one by one as they jump the fence and approach the village in fateful search of food?... With your vital help, we can keep them alive with emergency food and water and build humane enclosures for their protection and comfort. By reviving Ibb Zoo we can then transfer some of the enduring Predators from overcrowded Taiz Zoo, south of Ibb and release them from the cruel confinement of their concrete prison cells to these open-range enclosures here at Ibb Zoo ! Dedicating my entire life since February 2016 to rescuing Yemen's iconic, endangered World Heritage Zoo animals as well as running the Arabian Police Horses Rescue Mission in Sana'a, Yemen's capital and Rosabah Farm's Horses & French Dairy Cows in Dhamar, Yemen, I remain committed to stand by my moral duty as a British Queen's Guide and rally all animal lovers around the Planet to urgently support this veritable Animal 'Red Cross' for Yemen and succour THESE brave, suffering war refugees at Ibb Zoo too! Coordinated by Salman ALHADI and Omar Alqatiri Abda OMAR of CIF Ibb Local Government, Yemen. 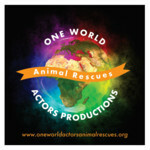 One World Actors Prods.-Animal Rescues Non-Profit hasn't posted any updates yet.